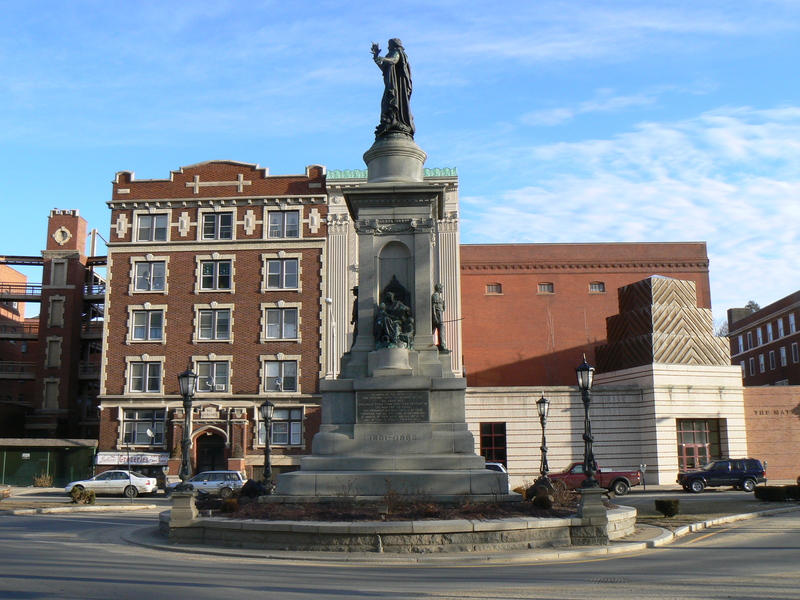 The elaborate Civil War monument at the west end of Waterbury’s green was dedicated in 1884 to honor local residents who served in the conflict, and, uncommonly among monuments of the era, addresses some of the social changes brought about by the war. 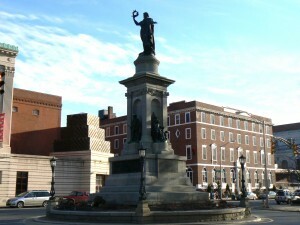 The monument, nearly 50 feet tall, is topped by an allegorical statue representing Victory. 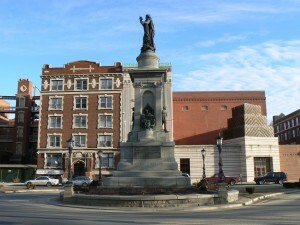 She stands atop a granite column that features four bronze statues representing the fact that people from all walks of life participated in (or were affected by) the war. 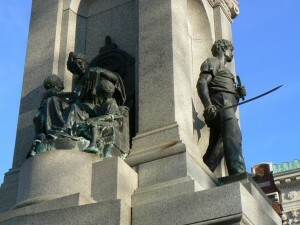 The west face, for instance, features a farmer clutching a rifle. 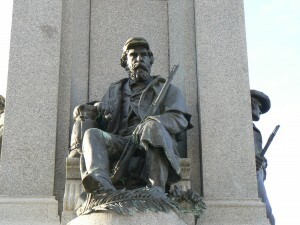 On the north side, a seated soldier, with bedroll and rifle handy, is resting. The east face features a laborer with a sword in his hand. The sculpture on the south face makes a rare reference to the emancipation of slaves by depicting a woman with a book reading to two children — one is white, and the other is African-American. This represents the new educational opportunities possible since the elimination of slavery. 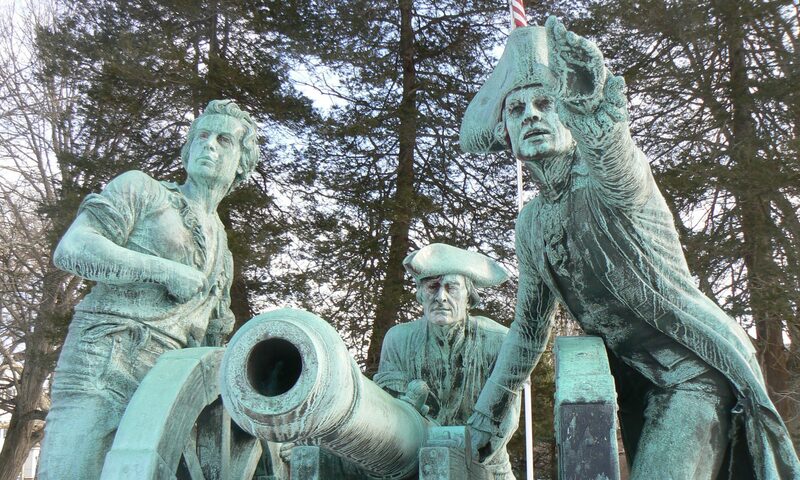 The west face also features a bas-relief sculpture depicting a pitched battle, and the east face displays the naval battle between the ironclad ships the Monitor and the Merrimac. Went forth to fight, if heaven willed, to fall! And hear a nation say, God bless you all! And came not home to hearts by grief made sore! Shrined in the nation’s love forever more! The traffic island hosting the monument (a location that hinders careful examination or photography) features four lampposts with shafts that are shaped like cannons with rifles leaning against them.